THE STORY - Emmet (Chris Pratt), an ordinary LEGO figurine who always follows the rules, is mistakenly identified as the Special -- an extraordinary being and the key to saving the world. He finds himself drafted into a fellowship of strangers who are on a mission to stop an evil tyrant's (Will Ferrell) plans to conquer the world. Unfortunately for Emmet, he is hopelessly -- and hilariously -- unprepared for such a task, but he'll give it his all nonetheless. ​​​​Art and commerce have always been uneasy bedfellows, particularly where it comes to children’s entertainment. For almost all of the 1980s, it was impossible to tell which came first: The toy (or entire line of toys), or the movie/TV show that starred that toy (or the entire line of toys). And for all that Hollywood has tried, it has yet to come up with a good movie or TV show based on a board game or video game (Jonathan Lynn’s 1985 farcical take on Clue probably comes the closest, assuming you enjoy its brand of humor). 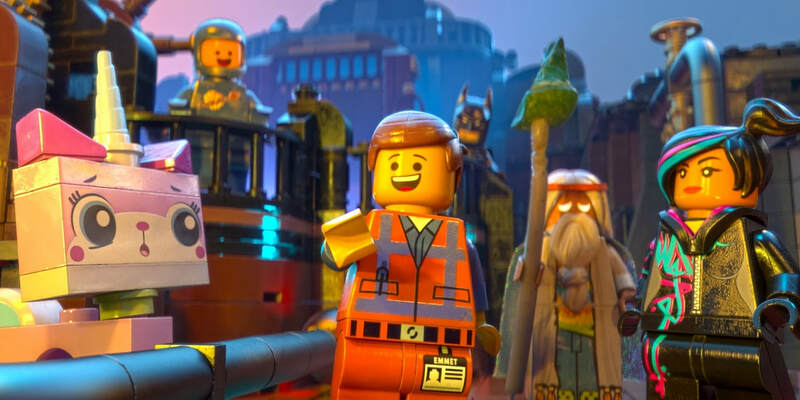 So it is some kind of miracle that "The Lego Movie," sitting as it does right at the center of the intersection of art and commerce, is as much fun and as technically accomplished as it is. The movie begins in the all-Lego city of Bricksburg, where to quote the ubiquitous theme song, everything is AWESOME!!! Construction worker Emmet Brickowski begins his day by doing everything according to the rules laid out in the instruction manual prepared by the city’s chief, Lord Business. He breathes, stretches, showers, eats breakfast, drinks outrageously expensive coffee, and goes to work with a smile on his face, exactly as the manual says. But he’s so generic that he doesn’t really have any friends among the hundreds of people he works with. But after falling down a hole at his construction site, he finds an artifact: The fabled Piece of Resistance, which prophecy says will one day be found by a “special one”, who will use it to thwart The Kragle, a super weapon that Lord Business intends to use to make everything conform to his will. And so begins Emmet’s Hero’s Journey. Because in addition to being a feature-length advertisement for Legos, "The Lego Movie" is also a spoof on the ever-popular Chosen One narrative arc. And it’s a hilarious spoof, hinging on Emmet’s utter UN-specialness as the very thing that makes him special in a group of decidedly very special people: The Master Builders, a group that includes nearly every single character Lego has ever licensed to be part of its playsets, including Wonder Woman, Superman, Green Lantern, Gandalf, Abraham Lincoln, C-3PO, Shakespeare, Shaquille O’Neal, and, of course, Batman. To say that Batman (voiced to gravelly perfection by Will Arnett) steals the movie may be obvious now, in a world where we’ve had "The Lego Batman Movie," but many of the movie’s sharpest satirical moments (“That’s a bat pun,” “First try!”) center around him, and the screenplay’s taking the piss out of the character after the overly self-serious Christopher Nolan trilogy is very welcome. That the film also manages to be a sterling example of a Chosen One Hero’s Journey story is icing on the cake, but then… is that even what this movie is? I imagine the breaking point with this movie, for most people, comes with the third act twist that (SPOILER ALERT FOR A FIVE YEAR-OLD BLOCKBUSTER) what we have been watching has all been one giant play session for a young boy named Finn, acting out against his father’s insistence that Legos aren’t toys, but a “sophisticated inter-locking brick system”, and that his creations are meant to be looked at, not touched, and certainly not played with (The Kragle? Turns out to be Dad’s Krazy Glue). And so it turns out that the movie was really a celebration of creativity and fun - specifically the creativity and fun that can be had with Legos, available at a toy store near you - all along! And really, that shouldn’t be a surprise. "The Lego Movie" is practically bursting at the seams with creativity and fun. The animation style may not have been a huge surprise to anyone who had played a Lego video game prior to 2014, but on the movie screen, nothing like this had ever been seen before. It’s CGI animation that looks for all the world like stop-motion animation using actual Legos, and it remains stunning to watch. Somehow, the animators got the explosions to glow like real fire, and the water to ripple and wave just like in any more traditionally-animated movie. Each and every frame is packed to the gills with detail so that there is constantly something new and exciting to look at. Visual gags are sprinkled throughout, often in the background of scenes (look at how the name of The Old West area stays hanging in the air as Emmet and Wyldstyle ride off towards the saloon! ), and they come thick and fast in some sections. All this can become exhausting, but thankfully writer/directors Phil Lord and Christopher Miller keep a pretty good handle on the tone of the movie so that it never veers out of control. Just about every scene is juggling about four or five different goals, and that the movie never loses sight of any of them is a testament to Lord and Miller’s skill. The impeccable voice casting also goes a long way: In addition to Arnett, Elizabeth Banks, Alison Brie, Charlie Day, Will Ferrell, Morgan Freeman, Liam Neeson, Nick Offerman, Cobie Smulders, and Channing Tatum, among many, many others, all turn in sterling performances. Chris Pratt voices Emmet, and he makes for a perfect everyman, a hero we can believe in even if his brain is largely just an empty void (we know this because we get to see it, in one of the film’s funniest jokes). So everything is operating on a ridiculously high level of quality in "The Lego Movie." Which begs the question: "How on Earth did the Academy only give this one Oscar nomination, and for Best Original Song at that?" Perhaps animators were offended by the surprise live-action section at the end. Perhaps voters thought it was more deserving of a Clio Award, for being a great commercial for Legos. Perhaps no one fully understood just how the animation in the movie worked, and thus couldn’t fully appreciate it. We may never know, especially since all of those reasons sound pretty weak. The fact remains that AMPAS’s snub of "The Lego Movie" in Best Animated Feature is one of the most surprising, most egregious snubs in the modern era, perhaps of all time. For my money, it was also robbed of a nomination for Sound Effects Editing, if only for the downright genius choice to give many of the vehicles and explosions the sound of a person making the sound of the thing, as opposed to the sound of the thing itself. It’s the little details like that that really demonstrate the cleverness and creativity that went into the making of "The Lego Movie." "The Lego Movie" could have been just an advertisement for Legos. It could have been an utterly standard adventure flick for kids. And that would have been fine. The animation, at any rate, still would have been eye-popping. But it turned out to be so much more. It is chock-full of the kind of creativity that is all too sadly lacking in so many blockbusters (and would-be blockbusters). It has humor and inventiveness to spare, and every frame offers something to marvel at. In short: It’s the best possible ad for Legos that the company could have ever hoped for, and it achieves that by embedding in its very concept the kind of play that has kept both kids and adults playing with Legos for years. It used the manual to build the playset, but it also took the random pieces to build something entirely new. What more could anyone have asked for?